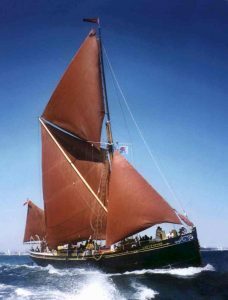 Thames Barge match (or race) for historic Thames Sailing Barges is an annual event, the first of which took place in 1863. This makes it the world’s second oldest organised sailing race after the America’s Cup, which was first held 12 years earlier in 1851. 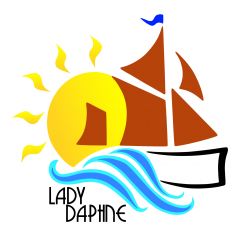 However, the Match Committee now considers the Thames event the longest running, regularly organised, national racing event for traditional sail in the world. This belief is based on the view that, although the America’s Cup started 12 years earlier, it has now changed out of all recognition. 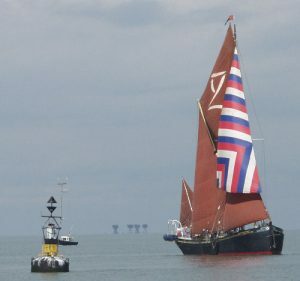 In contrast, The Thames Match remains true to the original vessel design and sail plans of the 1860’s. The race starts in Lower Hope Reach (off Stanford-le-Hope in Essex, about four miles down river from Gravesend) and runs down-river past Southend-on-Sea to the North Oaze Buoy before returning to finish at Gravesend – a total distance of 43 nautical miles. (The distance can be shortened if wind conditions are judged to be unsuitable for getting the barges back to Gravesend for the normal finish time). The finish line is usually near St Andrews Gardens next to the Three Daws public house in Gravesend and the finish can be watched during the afternoon from Gravesend’s historic waterfront or from the Essex side at the World’s End public house or Tilbury Fort. Guns on the Gravesend shore are fired to mark the finish of each vessel and the barges then moor in front of the historic Town Pier at Gravesend. Wind conditions on the day play a big part, but the average race lasts for about eight hours and is contested by upward of 14 barges, some of which are over 100 years old. The oldest vessel to have competed in recent years was built in 1881. Lady Daphne can choose to compete in the matches and limited spaces are available to book to actively participate in the thrill of the race. Alternatively we will operate as a following boat in some matches to give you some of the best shots as the race progresses around its course. Please enquire with us as to the availability of spaces for these events.